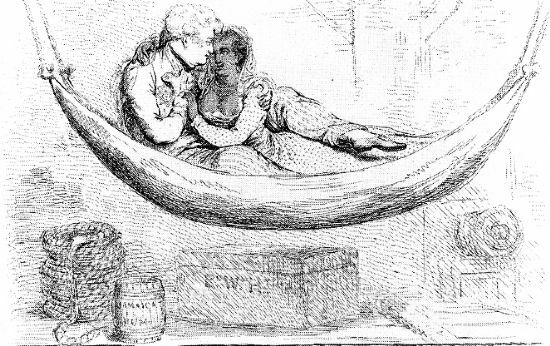 The first thing generally done by a European on his arrival in this country is to provide himself with a mistress from among the blacks, mulattoes, or mestees . . . the price varies from £100 to £150 . . . many of these girls read and write, and most of them are free. When a European arrives he finds it necessary to provide himself with a housekeeper or mistress – the children are sent back to England for education. Below: a print (1788) by James Gillray from La Rochelle Museum of Slavery showing a young European with his 'wousky' - a term also used by George Pinckard in his Notes on the West Indies (1796), p317. The man is, in fact, Prince William Henry, the younger brother of George III. Wowski was a character in the popular comic opera Inkle and Yarico, written by George Colman to music by Samuel Arnold, first staged in 1787. According to one source it was 'the play most frequently acted in the last 25 years of the 18th century (second only to The School for Scandal)'. For an illustration of the character for the play, in this case used to advertise the Grand State Lottery c1814, see the British Museum collection online. Tell me why need you? Ah don’t go grieve me! White man, don’t leave me. Thomas Cuming, son of Lachlan Cuming of Blackhills, who later qualified as a doctor.